I have to give Massdrop a lot of credit for trying to bring high-end audio to the masses through their audiophile community. 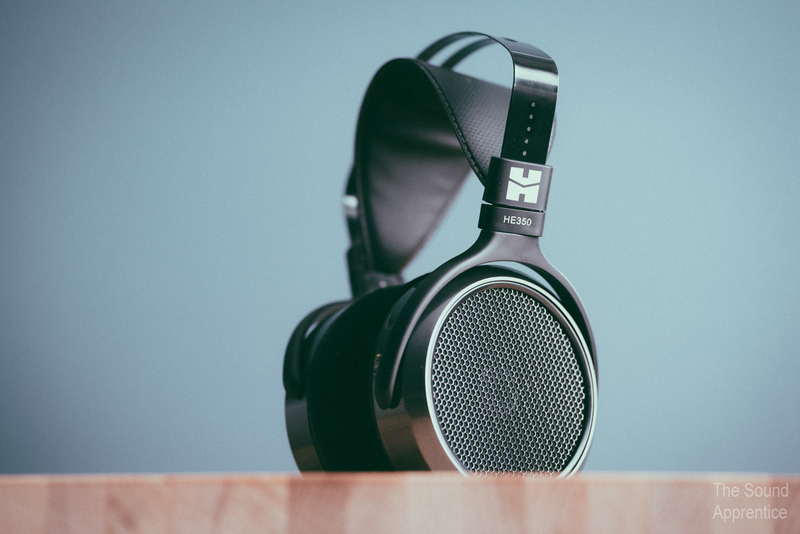 Those behind their initiatives have managed to bring together companies like AKG, Fostex, Grace Design, ZMF Headphones and now HIFIMAN, among others, to offer some great hi-fi products at affordable prices. So when I saw the drop for the $99 Massdrop x HIFIMAN HE-350 headphones, I thought it would be a great opportunity for new audiophiles and veteran headphone enthusiasts alike to pick up a pair of quality headphones to knock around with on the cheap. Unfortunately, in my opinion, cheap is mostly what you get this time around. Massdrop made a noble effort with this headphone. It looks great in a sleek metallic gray and black finish; it’s super lightweight and comfortable to wear with the improved headband; it has a custom easy-to-drive dynamic driver and new cable connections so you don’t have to fumble with HIFIMAN’s old screw-on coax connectors of the past. On paper, the HE-350, modeled as a successor to HIFIMAN’s entry-level HE-300 headphone, screams value. On the ears, however, it sort of just screams. Let me explain. Once the music gets flowing, the HE-350 may singlehandedly be the oddest sounding and most difficult headphone for me to describe fairly. At times, its easily one of the brightest headphones I have experienced in my audio journey to date. I have owned and demoed far more headphones than I have reviewed on this blog, and not one gave me the listening fatigue in such a small amount of time as the HE-350. What’s more, its unbalanced sound leaves you guessing at what you might get. Tracks leaning exclusively to the high side can sound decent. Mid-range-centric tracks are rendered OK. Bass heavy beats hit with some hints of sub-bass SPLs. But ultimately, when everything comes together, as is common when listening to most albums, the HE-350 doesn’t particularly shine in any one area. In fact, to my spoiled ears, it seems as if it can’t keep up, getting overly bright on the top end and muddied up in the bass regions, and the mids often get lost altogether. I wanted to like these headphones—I’m a sucker for a hi-fi bargain. I was hopeful that they’d be my secondary desktop cans that I toss on while editing photos or freelancing late into the night. But the moment I put these babies on, my ears were hit with overly-emphasized treble that simply left them begging for some balance. I’ve generally enjoyed my HIFIMAN products, but the HE-350 is unlike any others I have heard, and it left me seeking the meaty mids and brutish bass I desire in my listening experience. As a “cheap” headphone, I didn’t expect it to rival my high-end headphones in these departments, but even at this price point I expected more—mostly because it’s a HIFIMAN product, and Massdrop has successfully brought quality without the cost many times before. I may sound overly harsh here, but the HE-350’s treble is harsh. At low volumes it comes off as crisp and fairly detailed, but as the volume increases, so does the graininess, and with it comes a loss of clarity and enhanced edginess. “Pork Soda” off of Glass Animals’ How to Be a Human Being is a complex track with many layers. It starts out sounding fine with a moderately clean, punchy bass line that the HE-350 manages to move, as the vocals kick in though, the pitchy characteristics of the HE-350 become a bit overwhelming and only intensify as the track gets more complex as it progresses. For those familiar with some of the affordable Grado and Beyerdynamic offerings, I'd say the HE-350 has some of the grainy treble traits of the Grados with the sharp sizzle of the Beyers. Moving into the mids, I simply find them to be overpowered by the treble. My test for midrange includes John Butler’s “Ocean,” a nearly 12-minute epic studio guitar performance with plenty of complex tones and heart. The HE-350 never quite dug as deep to reproduce the full-bodied sound this track has like I would expect out of a headphone aimed at hi-fi enthusiasts. The same goes for tracks like “Eyes Wide Open” off of Ambient Jazz Ensemble’s Suite Shop (definitely worth checking out)—the horns have no gusto and the layers of instruments simply sound thin across the board without much separation. As for the bass, sometimes it surprises with a powerful delivery and other times it sounds rough and tumble. There’s something there, no doubt, but when pushed it falls apart pretty quickly. The textured deep bass lines in Moderat’s “Bad Kingdom,” for example, leaves the HE-350’s bass region in a rumbling, sloppy state. But then on Glass Animals’ “Season 2 Episode 3” the bass lines seem to hit fairly cleanly and gets my head bopping just fine. The more I listen to the HE-350, the more it confuses me. Sometimes it sounds pretty darn decent for the price, and then a track later I can’t get them off my head fast enough. Sure, I could try to tweak EQ settings on my PC setup, but that’s not my style. I want to hear the music as recorded and as my headphones can portray it—this is often where the term, “you get what you pay for” resonates well in audio (just beware of diminishing returns). I tested the HE-350 on various setups (FLAC files via a modified Squeezebox Touch into a Schiit Yggdrasil DAC feeding my Eddie Current Balancing Act and HIFIMAN EF-6 amplifiers; FLAC files on my Hidizs AP-100 DAP; streaming Spotify on my smartphone; CDs through a vintage transport and more) and ultimately concluded that it’s just not for me or my musical tastes. Your results may vary. As for that initial comment about being cheap—the HE-350 borders on feeling brittle (to me). The lovely box it arrived in actually feels more robust. The nearly all plastic construction has me concerned about long-term durability. Yes it makes it lightweight (congrats HIFIMAN, these are actually pretty darn comfortable to wear), but it feels fragile and, looks aside, doesn’t have the tactile touch of most products aimed at entry-level audiophiles. I suspect some accidentally broken yokes and cracked cups will be inevitable for some HE-350 owners. I’ve owned HIFIMAN's HE-500; I own the HE-6; I have had HIFIMAN earbuds in the past; I own their EF-6 amplifier; I’ve demoed many of their other headphones. In my opinion, the HE-350 is a missed opportunity. I won’t claim to know the economics behind this project, but I feel that HIFIMAN could’ve in some way delivered something closer to their house sound, which would've made the HE-350 the perfect gateway drug to their line of higher-end products. Maybe it still will be, but to my ears, the HE-350 comes up short. Listen, the HE-350 is a beautiful looking headphone, it’s comfortable, its detachable cable system is welcomed, and the ergonomics are on point, but the sound quality and overall material feel fall well short of being an “audiophile” product. To those with untrained or unspoiled ears, these may be amazing. But if you’ve already been introduced to high-end headphones, I think you’ll be disappointed. My regular readers know that I tell it how my ears hear it. I applaud the effort behind the $99 HE-350, but I can’t fully recommend this headphone for anyone seeking true hi-fi sound. If you want to try it out, I'd suggest trying to snag a used pair as they inevitably pop up on Head-Fi, Reddit or other audio forums. I look forward to the next collaboration between these two companies, but hopefully the next collaboration of Massdrop x HIFIMAN yields greater results. It's a shame that you havn't touched the few basic mods that picks this headphone's sound up. The two mods i've done are firstly the one where you remove the little sticker on the back of the driver. The second fix is to layer a thin sound inulator in the earcup. this could be toilet paper or anything like that. After these two things done. You willl have a headset with amazing soundstage, controlled highs, and punctual base. I hope you and others see this and return your reactions. links to the the mod guides. You could always put some new pads on, would alter the highs in some ways, relative to the earcups you choose. Thanks for the note, Emil. I'm sure a lot of people will try to mod these to alleviate some of the downfalls, but a lot of people also buy headphones without the intention of ever modding them. I am personally in that camp. I believe a headphone should perform well right out of the box, especially if it is targeted at the "audiophile" crowd. I hope the links you shared help out some of the other readers that are holding onto these though! Cheers.